Last Tuesday, August 7th, a Spanish Air Force fighter jet accidentally fired an AIM-120 AMRAAM missile over Estonian airspace. In this article we aim to formulate initial theories, while waiting for official NATO and Estonia Ministry of Defence ongoing investigation reports. First, we should explain the general context. It is well known that the three Baltic Republics do not have enough resources available in order to provide themselves with adequate air forces. Nonetheless, as NATO members, other Alliance’s member states put aircraft and crews at their disposal, in the framework of the “Baltic Air Policing” mission. Different countries participate in turn usually for six-month periods. At an operational level this translates into having two fighters ready to scramble in the event of an intrusion onto Estonian, Latvian or Lithuanian airspace. Spain has been participating since 2006, but more frequently since 2014. Let’s get into more technical matters. In order to carry out their mission, fighters are equipped with different types of missiles designed for air-to-air combat. 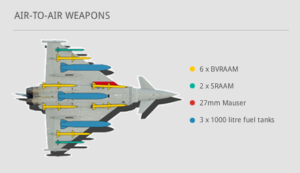 One of them is the AIM-120 AMRAAM. It’s a radar-guided, all-weather, medium-range (BVR: Beyond Visual Range) missile. Depending on the model it can reach a range between 30 and 100 Nautical Miles. It has a “fire and forget” guiding type, thanks to a built-in active radar and inertial system, which, at a certain distance of the target, allows the missile to be totally autonomous, not relying on the information from the launching aircraft radar. The Eurofighter can load up to 6 of these missiles at a time, which are configured in each of the stations where they are housed. The pilot can also configure and check from the cockpit through the “STORE” weapons display. In order to understand the case before us and be able to see what could have gone wrong to cause an involuntary missile launch, we must explain the pre-launch standard procedure that the pilot must follow. 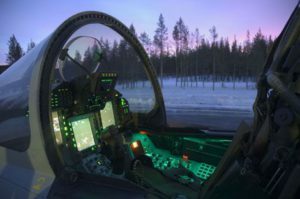 Based on the premise that the weaponry is well configurated and selected for each launch mode (FOX I, FOX II, FOX III), the next step is to be in flight and have selected A/A mode (“Air to Air”).This is the mode that configures the fighter software and enables all the symbols on the HUD (Head Up Display) to carry out an air-to-air missile launch, or, alternately, to fire the gun in an air-to-air mode. Once the aircraft is in an A/A mode and the option for the launching of a FOX III (name used by NATO for missiles such as AIM-120) is selected, the next step would be to position the MASS switch (Master Armament Safety Switch) on ARM. If this selector is on SAFE or STANDBY positions it is not possible in any way to carry out a real launching of any weaponry, but simulated launches can be made if it is on STANDBY position. Once this selector is on ARM position, a last selector which is named LATE ARM SWITCH, which is located on the fly control stick (HOTAS), must be checked. This switch has two positions, SAFE or ARMED. The SAFE position mechanically blocks the trigger so it cannot be pulled to fire. Therefore, the position ARMED must be selected and the trigger finally pulled in order to carry out the launching of the AIM-120. From studying the launching sequence for the firing of an AIM-120 AMRAAM missile from a Eurofighter Typhoon, we can see two probable theories for an accidental launching. On one hand there could be a software technical failure which allowed that, even if the MASS SWITCH was on STANDBY position, when performing a simulated launch, the system made a real launch. On the other hand, there could be the human error theory, which would have occurred at a moment if the pilot had not checked that the MASS SWITCH was on SAFE, or STANDBY mode, before performing a simulated launch. Or on the other hand, the pilot, despite being aware of having the MASS on ARM position, did not take the precaution of selecting the SAFE position on the LATE ARM SWITCH, in order to avoid that any involuntary movement of the pilot’s right hand, e.g. performing a high G’s manoeuvre, might cause a trigger pulling and therefore an accidental missile launch. Fortunately, no victims will be lamented. Finally, the investigations that are being carried out will eventually clarify the full sequence of events.